Magnesia phosphorica is one homeopathic remedy for back pain. There are several nautral remedies for back pain. Patients can use homeopathy for back pain by visiting a homeopathic practitioner and being examined. This is important because homeopathic remedies are very personalized, often having very specific circumstances for their use. For example, one homeopathic back pain treatment is kali carbonicum, which is used for a sense of exhaustion or brokenness in the back that improves with pressure, gets worse when the patient is on his or her side, and is worst between two and five am. Several different treatments are used by homeopathy for back pain, each with similar guidelines. 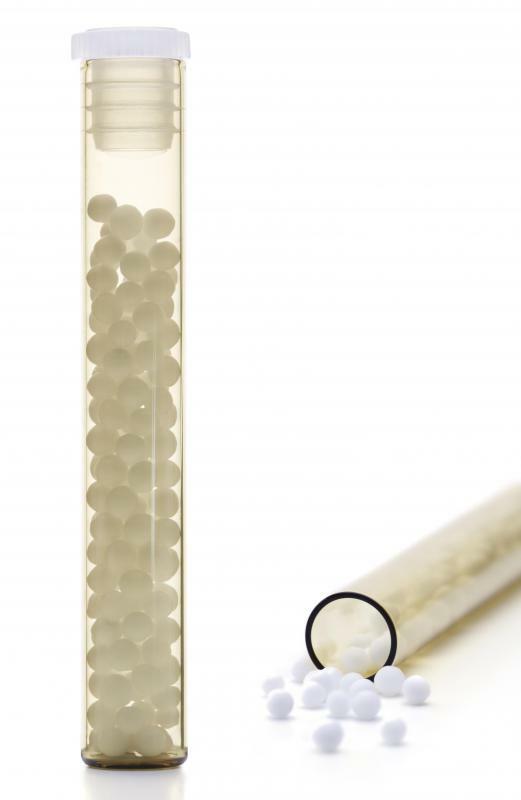 Many scientists believe that the only reason homeopathic treatments work is the placebo effect. The individualized nature of homeopathic therapy means that any patients wishing to use homeopathy for back pain should see a professional practitioner. It is possible to self-diagnose using websites and other sources of information, but the specified use of each treatment means that professionals are much more likely to select the correct remedy. They can do so after learning about specific ailments and symptoms. Homeopathic medicine is derived from a variety of substances. Belladonna, pulsatilla, sepia, and phosphorus are examples of back pain treatments used by homeopaths. Other treatments often used include rhus toxicodendron, magnesia phosphorica, and colocynthis. Belladona is one treatment used in homeopathy for back pain. This treatment is specifically used when the back pain is localized to the lower back and is sudden in nature. Cold temperatures make this sort of back pain feel better and it feels better when the patient sits up. The condition treated by belladonna gets worse at three o’ clock in the afternoon and after midnight. Rhus toxicodendron is another treatment used in homeopathy for back pain sufferers. This medicine specifically treats back pain caused by overexertion and that feels better when exposed to heat. The pain treated with this substance is more like a dull ache, accompanied by stiffness in the lower back. The pain worsens when the patient is exposed to cold air and during the first stages of movement. It gets better during continued movement. Homeopathy is based on the idea that an active ingredient diluted exponentially in water is more effective than the ingredient alone. Most homeopathic remedies are classified as either "X" or "C," meaning that the ingredient was diluted one part to either 10 or 100 parts water. The number preceding the "X" or "C" indicates how many times this process was done. For example, a 30C concentration means that one part of the active ingredient was diluted in 100 parts water, then that solution was diluted in water in the same way. This repeats until thirty dilutions have taken place. How do I Choose the Best Piles Homeopathy? What are the Uses of Sepia in Homeopathy? What are the Different Methods for Holistic Healing?